Alternatively titled: look, more pictures of corners! This will seem strange to you old house owners, but in our two odd years of living here we've now knocked down a total four closets *hits head on wall. 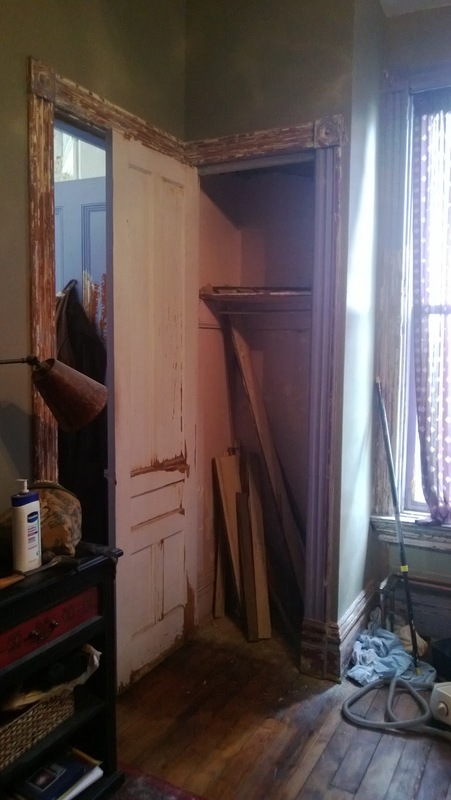 * Although all of these were added in the 20's as part of the triplex conversion and needed to be removed to restore the house, it's still unfortunate that lots of stuff is still living in plastic tubs on the third floor and in the basement. This weekend saw the destruction of the fourth closet (still one more to go), which happened to be in the room we're using as a master. We believe this room would have been Mrs. Kelly's room, as evidenced by the gorgeous Art Nouveau woman in the moon fireback (which I can't get to to take pictures of at the moment), tower windows, newly discovered wallpapers, and position over what should be the front porch. The adjoining room is much larger, but has a much more masculine firebox surround with bulldog looking gargoyles in it, it's also on what should be the front of the house. Strangely (from a modern master bedroom perspective), this is by far the smallest room on the 2nd floor, but the adjoining room was the only one that lent itself to being split up (master bathroom, walk in closet, and laundry), and I am enthralled with the fireplace and tower, and refuse to share them with anyone! 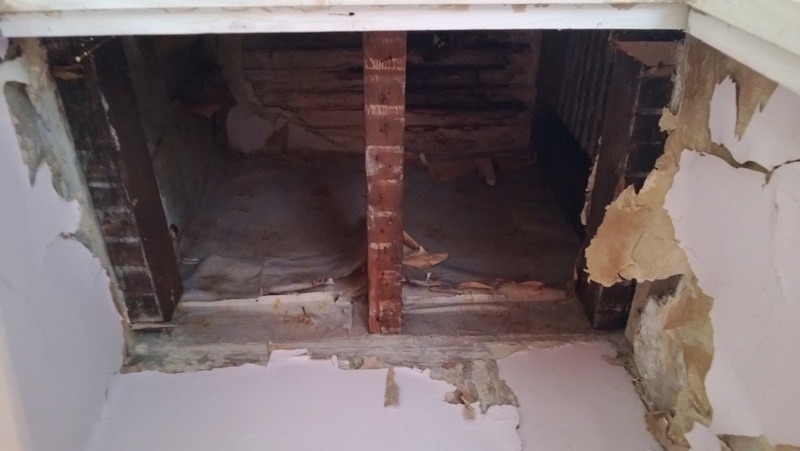 The closet we tore out had served as a chute for water leaking through the gutters on the roof down to the first floor, reparing it would have required demoing and rebuilding a substantial part of it, all while working inside a roughly 2x2 space. Given the minimal amount of storage it offered, and the way in which it threw off placing furniture in the room, it drew the short straw and had to go. On Saturday we pulled off all the trim and demoed all the plaster and lathe. 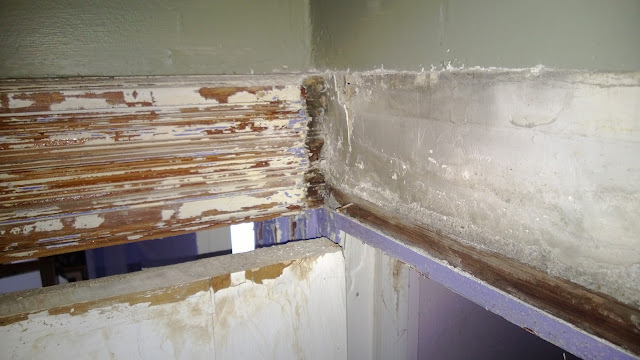 Demoing plaster is not for the faint of heart - I don't know why anyone would do it except as a last ditch solution (here tearing out plaster and replacing with drywall is seen as a matter of course when many people buy a house, awfulness). One wall, 10.5 feet tall by 2 feet wide filled 10 contractor bags, just saying . . .
We had planned on opening that big window and putting one of our many box fans in it venting out (the best method for controlling the dust, makes it look like your house is on fire), however it turns out that window is painted shut (as are 75% of our windows). Since we don't have a tall enough ladder, and didn't want to reassemble the scaffolding, we opened windows in the other rooms, and just went slowly and cleaned up as we went. 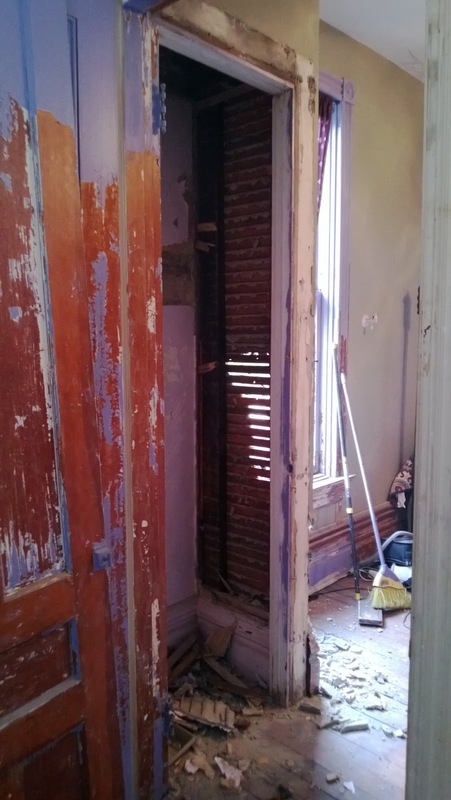 Yesterday we took down the framing (which wasn't really attached to anything) and danced a jig when we saw the closet had been built over the original molding. This may be the only time they built something respecting the house (I mean, they trashed all our over-mantels the entire quarter-sawn cherry staircase, and all our picture rail and paneling). 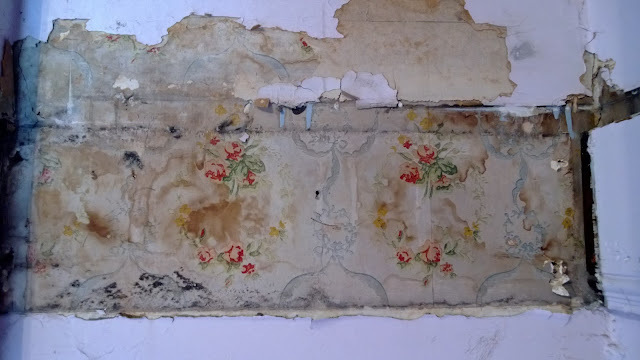 I also got a look at the wallpaper that had been hidden in the drop ceiling of the closet. The floral was below the picture rail, while the aesthetic movement/japonesque silver and white cloud paper started above the picture rail and continued onto the ceiling. This house had extraordinary wallpapers throughout when it was built. The ceilings on the 2nd and 3rd floor were each papered in a different cream or white iridescent patterned paper. Contrast that with the room when we bought the house; light purple paint on the walls and ceiling with no primer over the bare plaster (it was chipping and peeling off in sheets), darker purple over the shellacked woodwork, and in the closet they used the light purple over the wallpaper, moldings and floors. Ewww . 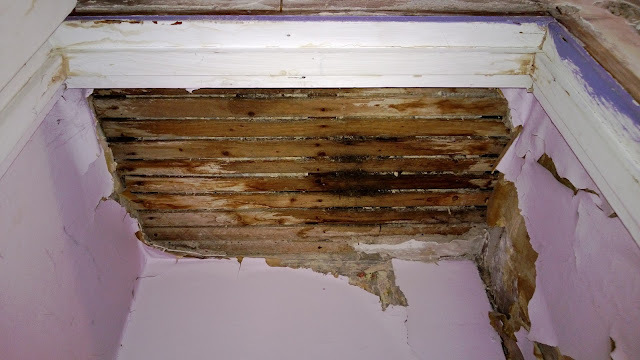 . .
Ok, this somehow got quite long, so I'll do another post on patching the plaster tomorrow. Here's where we stand now. You are working so hard! 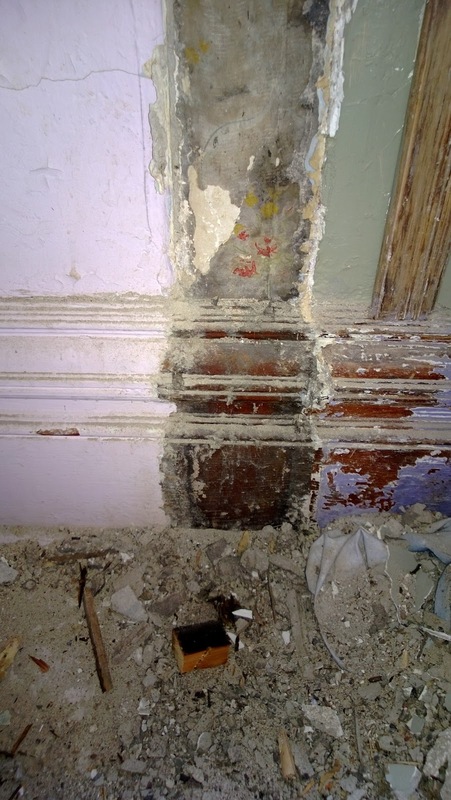 Looking forward to the post on patching plaster. 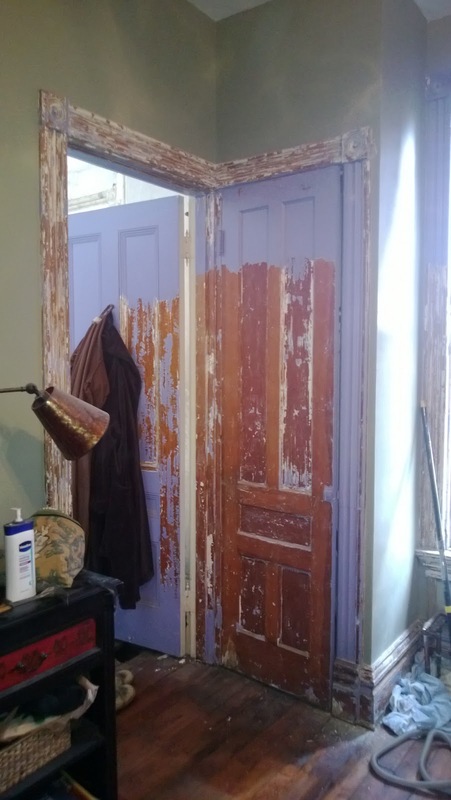 Our 1907 house has original closets but the plaster in the closets have never been painted. Your home is going to be beautiful! Silver and white cloud wallpaper....I swoon. Are you going to replace the wallpaper? Hopefully at some point we will, but I'm thinking the ceilings upstairs may end up getting stenciled - closer matches to the patterns are possible that way (not to mention infinitely cheaper), and only two colors are needed so it shouldn't be too bad . . . I saw a stenciled ceiling with stars in a blog somewhere today and I thought about you. Stenciling would be terrific. good news everybody . . .